Today let me introduce you to Jennifer! Hello my name is Jennifer. I married my high school sweet heart Jacob. We will be married for 14 years this March. We have two Christmas babies: Jennica (11) and Justin (6). I have a BS in Apparel Merchandising and Management with a focus in Manufacturing. I work part time as a lunch lady just to get out of the house. Eventually, I need to find a full time job because my husband says I need to use my degree. Although, I don’t know what I want to be when I grow up. LOL! I enjoy all things crafty from sewing, beading, scrap booking, and my latest passion stamping. I love everything about stamping: the creating, collecting, and buying. Stamping reminds me of when I was younger: coloring, cutting, and pasting were some of my favorite past times. Who said, we had to stop doing that kind of stuff when we’re adults. If you were a thumbtack where would you stick yourself? If I were a thumbtack, I would be placed on a college campus bulletin board. I want to see a lot of action. 5 Random Facts about you! 1. I live in California. 2. I like to go camping. 3. I have two kids: Jennica and Justin. 5. I married my high school sweetheart. If you had to choose between being color blind or losing your sense of taste for the rest of your life, which would you choose? Why? I would choose to lose my sense of taste. Maybe then I will lose some weight. What fictional character is most like you? I don’t read much but I think I would be like Bella from Twilight. I lullzed at Jen’s answer to the thumbtack question! What a great spot! Welcome to the team Jen – I am thrilled to have you!!! Now, head on over to Jen’s blog where she has another giveaway you could win! Not to mention that you can check out all the fun and be inspired by her creative goodness and flair! This girl has it! Thanks for stoppin by and join us again tomorrow for another intro, an interesting read and another giveaway! We are back for a fun week of DT intros! Join us all the way thru Friday then back again Monday for more! Don’t forget to get in on our first challenge HERE so you can have your chance to win! Today I want to introduce you to Shelly! I’ve been stamping for several years now. I started out with a home party and rubber stamps and since then have moved more towards digi’s. I love to create and try new things and inspired by everything around me. It’s amazing just how much variety is out there. Stamping is my creative outlet usually after the kids have gone to bed. It’s the best hobby I’ve found so far…and is rather addicting but in a good way. Shelly has a love of houndstooth that rivals my own I think! With her app she submitted this project that was just amazing! Shelly also answered our Odd questions! Let’s get a deeper look into the creative mind! What makes you Odd? My sense of humor. It can be rather quirky. If you were a thumbtack where would you stick yourself? In a crowded area behind a glass display so I could be seen by everyone but only used by a few. What ONE crafty item do you most identify with and why? A brad. Stylish and sharp. 5 Random Facts about you! I have a twin brother, I can’t swim, I try to think the best of people, I have been known to shake Christmas presents and I love to watch Reality T.V. If you had to choose between being colour blind or losing your sense of taste for the rest of your life, which would you choose? Why? Hmm….I’m not sure I’d enjoy food without a great sense of taste (especially chocolate) so I’d rather be color blind. My hubby would have to coordinate my paper colors so I could still create. What a lucky guy! What fictional character is most like you? Buffy the vampire slayer- quick reflexes and always ready for a challenge. Well we’ve got two foodies in the house! LOL! I’m thrilled to have Shelly on the DT! Her work has been blowing me away! 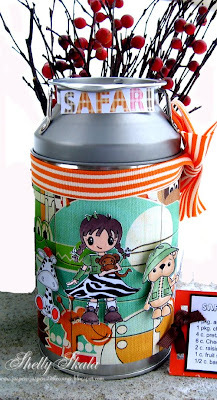 If you want to see it for yourself jump on over to her blog for the Giveaway Shelly is hosting for today’s festivities! You can’t go wrong and you’ll come away with so much inspiration you’ll have to grab your own houndstooth and get to craftin! Join us tomorrow for another intro and another giveaway! Hi to all the Odd Girls of the world! I hope our first challenge yesterday is getting your creative juices flowing! Today and then starting back up on Monday I would like to introduce you all to our lovely Design Team! These girls repeatedly blow me away with their talent, skill and dedication! Its fitting then that each of them get a day to SHINE! Today is all about my fabby DT Coordinator Leah l’orange! HI! I’m Leah the Orange, and i am SO excited and honoured to be doing this whole Some Odd Girl thing with my “Holmes”-slice, Kristy! our Odd Girls are amazing, and we hope you’ll have lots of fun with the images and the challenges. I’m a Canadian import, living in South Jersey (no, they don’t say “JOY-ZEE” here, but they do say “WOOD-ER” for water! ), because i married a crazy yank. i don’t miss the Canadian winters, but the SOUP here in the summertime is a little tough to bear. I’m not an artist, but I’m artsy. I’m not a musician, but i perform music. I’m not almost 36, but i am. i work from home and spend my waking hours on the computer, so when the clock strikes 5, I’d prefer to get CRAFTY over just about everything else! i only know one language fluently, but i speak my own language. i am a foodie, an indie film snob, a cruise director, and a little random at times. only fitting that I’m an Odd Girl, right? What makes you Odd? my quirky mannerisms, daring sense of style, i speak my own language and i HATE bananas! What ONE crafty item do you most identify with and why? ADHESIVE! I’m often the “glue” that bonds a group together. i can instigate (like when you stick something down and have a hard time repositioning it to get it JUST RIGHT), but I’m usually pretty good at playing the peacemaker – the diplomat – and can manage to put things back together again. ~ I’m a ‘business woman’ – sounds so distinguished, right? but I’m a weirdo and it’s a good thing i do business over the phone, because most of my customers wouldn’t take me seriously if they saw me! ~ i seldom wear black. ~ my hair has been every colour of the rainbow. ~ i know lots of stuff about cars and can usually identify them by the shape or colour. i can change my own oil, too, but i don’t. What fictional character is most like you? BUTTERCUP! do you remember the PowerPuff Girls? Buttercup is the FEISTY one, who’s not afraid to do her own thing, and think for herself. she calls it like she sees it, she doesn’t take any crap from anyone, she’s strong-willed but sensitive and VERY GOOD at holding grudges. 😉 she isn’t the “leader of the pack” but she demands that her opinions be heard. SO me. I love this questionnaire! You can look forward to a WIDE variety of answers and some surprising similarities in the coming days. NOW I would love for you to jump over to Leah’s blog where she has a giveaway to celebrate all the fun goin on here at the Some Odd Girl Challenge Blog! I’m serious though, be warned, her blog is addictive! Not to mention you can learn some more Leah-speak! We love you girl! Thank you for being my guinea pig, co-conspirator and friend! MWAH! Come back on Monday for another intro and another giveaway!